Shrewsbury Market Hall has scooped a major national award, being named ‘Britain’s Favourite Market’ in the Great British Market Awards today (Thursday 25 January 2018). 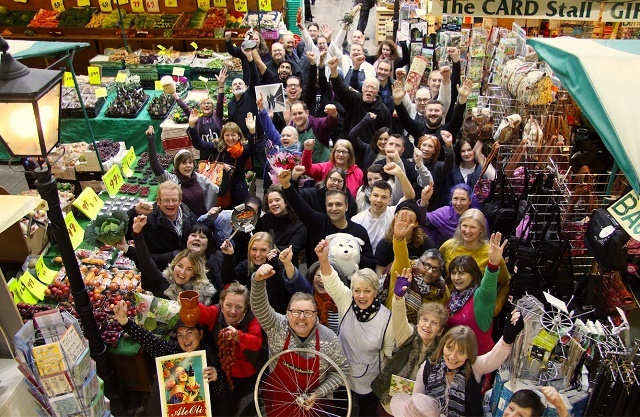 The Market Hall, which has transformed massively in the last few years, was described as “an exciting and inspirational market” by judges from the National Association of British Market Authorities (NABMA). Shrewsbury Market Hall, which is jointly run by Shropshire Council and Shrewsbury Town Council, was one of six UK finalists shortlisted for the coveted title of ‘Britain’s Favourite Market’. Shrewsbury was up against markets in Barrow-in-Furness, Cambridge, Leeds Kirkgate, Norwich and Skipton. All finalists had been shortlisted in a public vote that ran through October and November. The second round of the competition involved visits by both judges and a mystery shopper. The winner of the award and other Great British Market Awards were announced this afternoon at the NABMA One Day conference in Birmingham. “We are absolutely thrilled to receive this award and national recognition. “We want to thank all of our stallholders for making it such a fantastic market and a big thank you also goes to everybody who voted for us. “On behalf of the business community in Shrewsbury we congratulate the Market Hall on this fantastic national award and achievement. Shrewsbury Market Hall has nearly 70 pitches. Its popularity has boomed in recent years. This was given a further boost last year when it began opening for regular Saturday night events that attracted crowds of up to 1,700 people during the course of an evening. Kate Gittins, Helen Ball and Seb Slater, Executive Director of Shrewsbury Business Improvement District, also gave a presentation to the NABMA conference about partnership working.